Sri Lanka bagged the key wicket of Joe Burns for 180 Saturday but there was little else to cheer about with Kurtis Patterson hitting a maiden 50 as Australia piled on more runs in the second Test. 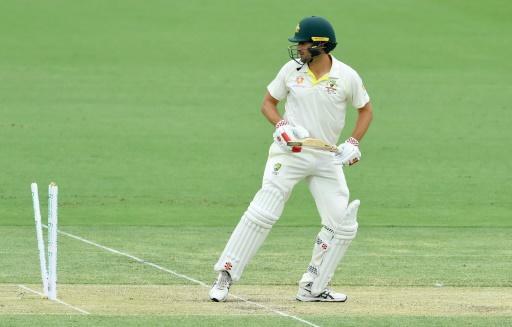 Australia’s Joe Burns was out for 180 on Saturday, day two of the second Test against Sri Lanka in CanberraSri Lanka bagged the key wicket of Joe Burns for 180 Saturday but there was little else to cheer about with Kurtis Patterson hitting a maiden 50 as Australia piled on more runs in the second Test. Opener Burns punished the inexperienced Sri Lankan attack on Friday in a 308-run stand with Travis Head (161), carrying his bat through the day. At the other end Patterson, who earned a debut in Brisbane after hitting 157 and 102 for a Cricket Australia XI in a warm-up against Sri Lanka, reinforced his credentials as an exciting No.6.